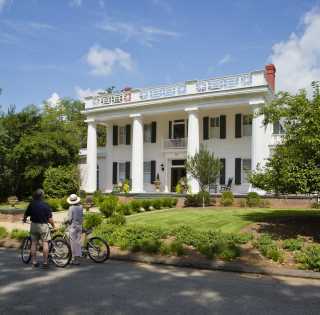 Explore the southern charm and beautiful scenic byways of the Antebellum Trail Bicycle Route, a 170-mile trek that winds through a collection of Georgia’s most beautiful antebellum towns. In each town along the way you will experience an abundance of unique history, much of it tied to the American Civil War and our country’s Native American heritage. Eatonton and Gray offer a rare opportunity to experience Small Town USA. Take time to visit each community’s Welcome Center, town square, shops, restaurants and quaint settings and you’ll be guaranteed to get a big helping of the simpler pleasures in life. We hope you enjoy your travels along the ATBR. More information on these friendly towns and the physical characteristics of the route is available on Georgia Bicycle Adventures’ blog.